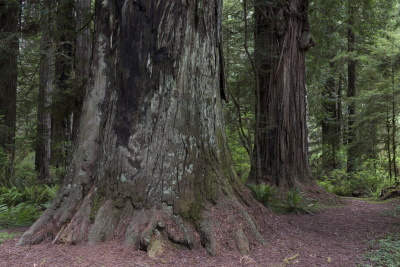 Redwood National and State Parks protect 45% of all remaining Coastal Redwood old-growth forests, the tallest and one of the most massive tree species on Earth. The park also contains the tallest known tree in the world at 112.1m. The coastal redwood forest forms an unique and diverse resource: redwoods are surviving remnants of groups of trees that were once found throughout many of the moist temperate regions of the world. Threatened birds encountered here include the endangered brown pelican, southern bald eagle and American peregrin. Over 40 species of mammals have been documented, including the black bear, mountain lion, bobcat, beaver, river otter, black-tailed deer, elk, and coyote. Along the coastline, California Sea Lions, Steller Sea Lions and Harbor Seals live near the shore and on seastacks, rocky outcroppings forming small islands just off the coast. Dolphins and Pacific gray whales are occasionally seen offshore. Roosevelt elk are the most readily observed of the large mammals in the park. The designated area also includes three California state parks: Jedediah Smith, Del Norte Coast and Prairie Creek Redwoods. Driving along the Pacific coast from Los Angeles to Portland, Oregon is maybe one of most stunning road trip routes in America, and one of the most memorable parts along the way is between Eureka and Crescent City in Northern California, the home of the impressive coastal redwoods. It was a really fine day of early summer when I reached Eureka and started to find a sign of Redwood National and State Parks. Since I was not sure what the redwood is, except that it should be a very high tree, so at the beginning I misunderstood that the very high pine and fern trees along the highway were redwood which I already impressed for its height and how dense of the forest was, but I started to noticed that among those dense forests, there was a kind of tree that specially higher than the others with different leafs and branch patterns. When the highway approached the Stone Lagoon and Freshwater Lagoon while entered into the Prairie Creek Redwood State Park, the view of redwood forest and the Pacific coast with misty cloud were quite stunning. I stopped at the Freshwater lagoon to see beautiful wildflowers fields next to the beach, the unique saline bushes and flowers were pretty interesting. My next stop was Lady Bird Johnson Grove, named after US First Lady. When I entered into the grove inner area and really saw the gigantic redwood trees for the first time along the easy hiking trails, I was extremely impressed for this natural wonder. I continued my journey to Crescent City, along the highway, there were more and more redwoods and the forest became denser and denser that car’s front light was mandatory during driving in this wonderful forest of Del Norte Coast Redwood State Park. Since this group of forests was just next to the Pacific Coast, there was mist covered the whole forest, I decided to stop and parked my car along the highway and did some hiking in the misty forest, the atmosphere were indescribable, it was like walking in the enchanting forest in fairy tales. The mist covered the whole forest and I could not see the top of the tree. One thing I noticed that the forest soil was really moist because of the mist, which really contrast to the one I saw at Lady Bird Johnson Grove. I walked around the forest for an hour; happily saw many mushroom, wildflowers and impressive redwoods. I ended my day at Crescent City, after had one of best clam chowder I’ve ever eaten, I checked in the hotel and discovered that the view from my room was the whole redwoods forest. The next morning I drove on the famous Howland Hill road which cut through the redwoods forest of Jedediah Smith Redwoods State Park. The view along this dirt road was really stunning with hundreds of giant redwoods, much better than the one I saw in other state parks. On the way I stopped at Stout Grove which was very beautiful and very scenic next to the river. The trees here are also bigger than other places. I really enjoyed my time in this grove before I continued my trip to other impressive US national parks, the Crater Lake National Park in Oregon. Visiting Redwood National and State Parks turned out to be one of my favorite places in California. Before I came here I was doubt that these were just forests of big trees, and I would satisfy with only one grove; however, after one grove, I wanted to see more and more since the forests are really stunning. I also lucky enough that in only half day I encountered the sea of mist from Pacific Ocean descended into the Redwood twice, and really enhanced my experience and understanding of how unique of these forests. The wildflowers along the coastal beach were also great, something that truly unexpected. After saw many groves of redwood in this World Heritage Site, in my opinion the Jedediah Smith Redwoods State Park is the best place to enjoy the redwood, especially along the Howland Road and Stout Grove which are really stunning; however my favorite turn out to be Del Norte Coast Redwood State Park for an indescribable experience of hiking in the thick mist under countless of giant trees. 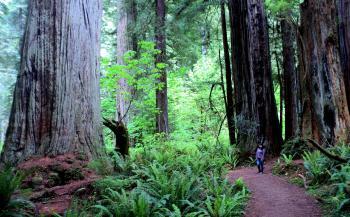 Redwood is another great World Natural Heritage Site of USA. We went thru then every years for about 7 years on vatacation each year, going to Cal. ,when I was a child. I have pictures of us kids in the shoe made out of one of the Redwood trees.There is windows in the shoe and one of us is in each window looking out while our picture was taken.They called it "The Shoe House I think.For thats what it was.I also remember a Novelty Shop built in one of the trees.Very big inside.You could buy things to take home.All kinds of things that were shape like the trees,like the shop & etc. I remember a drive thru tree,where u drive thru it with your car..I hav pictures of my dad and us standing on top or a fallen tree also standing beside the large trees.Never will forget this experience.Lots of memories of those days and the fun we had there. Following the previous days 11 hour drive from Los Angeles, visiting Redwood National Park is a challenge because of its remote location. (5 hrs drive north from San Francisco) Nevertheless, having the privledge and opportunity to visit such an ancient coastal Redwood forest was without a doubt a worthwile experience. What sets Redwood National Park aside from other California National Parks that have old-growth forests is the diversity of landscape. For those wanting to stroll around ancient trees, visit the Lady Bird Johnson Grove. During the morning fog, this grove is something you will never forget. There are numerous other groves throughout the park, but to provide the full picture of this incredible ecosystem visit other areas as well. I would recommend hiking Fern Canyon Trail, a fairly short hike that follows a small stream amidst vertical vine/fern covered canyon walls. Furthermore, there are over 50 km of coastline in the park. Enjoy a perfectly empty California beach in the summer! This is another unique aspect of Redwoods National Park, it recieves a fraction of the visitors compared to Yosemite or Yellowstone. Large areas of prairie are also found in the park, and it is not uncommon to spot a herd of Elk grazing. 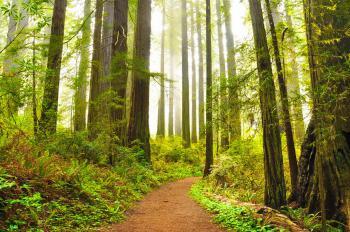 Redwood National and State Parks is one of the United States best national parks and a worthy world heritage site. I lived and worked in Redwood National Park. I miss it, my home that I may never get to see again. I will always Love and Cherish my time in the Redwoods. This unique forest environment is well worth the time and residual neckache to see in person, otherwise the concept of scale just can't be fully transmitted. These giants are more than just tall, they're monumental. Feeling small is part of the fun as you gaze upward, though the rest of the scenery merits a look down now and then. Among the world's oldest living things, these trees more than deserve their place on the list. A walk among the redwoods, and a sore neck from cranning to see the tree tops. The redwoods create their own micro-environment so insects can thrive among the giants. For these tress, fire is a good thing, otherwise they won't drop their seeds. From "Redwood National Park" to "Redwood National and State Parks"
Pliocene: In its limited coastal location it "escaped" the last Ice Age. "Seqouia sempervirens had reached its northernmost limits during the Paleocene and Eocene, 65 MYA to 38 MYA. It is known to have been on the islands of Svalbard, today part of Norway and well above the Arctic Circle (Snyder 1992). During the Oligocene and Miocene, 38 MYA to 6 MYA, its range had moved south due to cooler and drier climates, and by the Pliocene it had become established in its present location"
Star Wars: Northern California's giant redwood forests doubled as home to the Ewoks on planet Endor.